Businesses have learned that it is imperative for them to focus on their customers. Customer service, customer orientation, customer centricity – meaningful concepts became popular. The problem is, however, that there is only a fine line between serving your customer with a pleasant experience and annoying your customer. 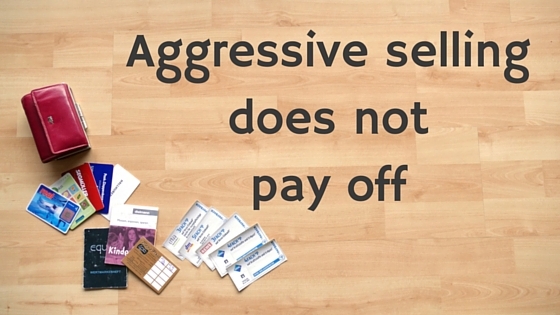 Aggressive selling will defintively lead to the latter one. This is a little story from my daily travel to work that happened some years ago. It can teach us a lot about mislead customer orientation and aggressive selling. I used to go to work by car and had to refuel about every two weeks. There was a gas station that was situated very conveniently on my morning route. Thus, I was a regular customer there. I did not care if the price per liter was half a cent lower somewhere else or if any other gas station had more tasty morning coffee. This gas station was easy to reach and that was all that was needed to keep me happy. But someday, they lost me as a loyal customer after several years. What had happened? The company had decided to introduce a customer loyalty program in order to increase my loyalty. They issued a customer card with which I could earn some bonus points that could be swapped into some ‘attractive presents’. That would not have troubled me. However, the guy at the counter probably had made it his personal mission to acquire me for this loyalty program. Or he was forced to do so by some internal reward scheme. For several reasons I had decided that I already had more than enough loyalty cards in my wallet and did not want any more. (Especially since I had no idea what I should do with all those coffee machines, shower towels, training bags and the like that I could get for my bonus points). I rejected his offer several times. Unfortunately, this guy – although he perfectly recognized me – did not give up offering me his loyalty card every time. In the beginning my rejection was quite friendly. Some weeks later I felt the need to become a bit more explicit: “As I have already told you last time and the times before – I am definitely not interested in your loyalty card and I will not be in the future.” Nevertheless, this guy did not give up trying to convince me better. I had to endure his endless offers again and again. This finally made me turn away. I discovered another gas station. It wasn’t located as conveniently as the first one. But the little detour was less troublesome to me than the regular early-morning-discussion about loyalty programs. Thus, a business had lost a loyal and completely satisfied customer by trying to make him loyal. Refueling my car is a commodity for me. I don’t need any bells and whistles. I don’t expect a superior customer experience. All I want is a quick, easy and reliable service. Anything beyond that would have a negative impact on my experience. Their mistake clearly was their over-aggressive selling practice. It is a good idea to offer something to the customers that probably is of value to them. It is also a good practice to offer this new feature in a one-to-one way, i.e. to make a personal offer during the payment process. It is, however, a poor practice not to connect this approach with a bit of personalization. Here, they had simply missed to make a mental tick in the box ‘customer is definitely not interested’ (not to be mixed up with the box ‘customer is still undecided’) and to connect this information with the other information ‘customer already is a loyal and regular one’. These two pieces of information together should have led to the only conclusion that it was best not to bother me with this offer any more in the next future. It doesn’t matter if this process is made in the head of some shop attendant or in a computerized data management system. If the business is not able to make relevant connections between related pieces of information and to draw the right conclusions form them, their customer relationship efforts will have a good chance for failure.